So, there are two ballot measures on the California ballot that talk about single-use plastic bags, those environmental scrounges known for clogging up storm drains and choking sea life. Proposition 65 claims it will redirect money collected by grocery stores that sell carry-out bags into an environmental fund managed by the California Wildlife Conservation fund. Proposition 67 is a voter referendum on the state legislature&apos;s Senate Bill 270, which outright bans the sale of single-use plastic bags in all of California. Both of these propositions were placed on the ballot through the efforts of the American Progressive Bag Alliance, a coalition of plastic bag manufacturers who are very interested in making sure they can continue selling their bags to grocery stores and retailers in the state of California. Because nothing can be easy in our cold cruel world, Prop. 65 and Prop. 67 require a bit of mental gymnastics to think through. Luckily, it&apos;s not that hard, and we&apos;re here to help. We&apos;ll start with Proposition 67, since ultimately it&apos;s more important. Proposition 67 is a "veto referendum," which basically means voters are being asked if they want to veto (strike down) a law previously passed by the state legislature. Like I mentioned before, the bill in question is S.B. 270, which prohibits grocers and other stores from giving out single-use plastic bags to customers. A &apos;Yes&apos; vote on Prop. 67 upholds the existing state legislation, and a &apos;No&apos; vote would strike down the law. 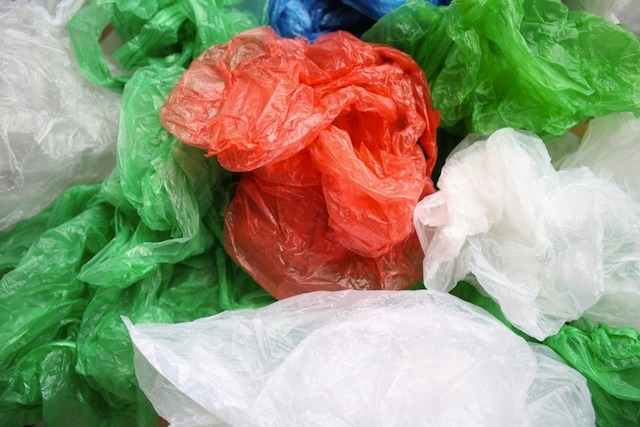 Upholding the existing legislation means single-use plastic bags would be banned statewide. Proposition 65 is trickier—literally. Though it includes a lot of frilly language about environmental conservation, the actual meat of Proposition is more confusing. If passed, Prop. 65 would require revenue generated by the mandated sale of reusable carry-out bags to be deposited into a state environmental fund. The catch is, this only happens if another state law (the one being voted on in Prop. 67) prohibits the distribution of single-use plastic bags. For Prop. 65 to take effect, Prop. 67 would have to pass. But I thought you said that both Proposition 65 and 67 were put on the ballot by the plastic bag industrial complex? I did! That&apos;s why you have to be careful. See, the plastic bag industrial complex wants you to vote "No" on Prop. 67. A "No" vote on 67 strikes down S.B. 270, meaning single-use plastic bags would be free to stick around. Proposition 65 is a trick intended to confuse and frustrate voters into voting "No" on both propositions. It&apos;s no accident that the referendum on single-use plastic bags comes at the very end of the ballot. The plastic bag manufacturers are hoping that enough Californians will be frustrated with the enormous list of poorly worded ballot measures, and will just start voting &apos;No&apos; on everything as they get towards the end of the ballot. More than 150 cities and counties in California have already banned single-use plastic bags—Los Angeles, Long Beach, Pasadena, Santa Monica, Glendale, Malibu, Manhattan each, West Hollywood and Los Angeles County are among them. If you are against single-use plastic bags, vote "Yes" on Proposition 67 to uphold existing state legislation. If you&apos;re strongly in favor of the bags, for some reason, vote "No." Proposition 65 is much less important, and ultimately could slow down the process by which bags are actually banned if voters pass Proposition 67. Remember that it&apos;s a trick proposition that would just add unnecessary rules about plastic bags to the state&apos;s law code. If you feel super strongly about not letting grocery stores keep the revenue from reusable bags sold in the stores, vote "Yes" to allocate that money into an environmental fund. Otherwise, just vote "No." If you just want bags to be banned, vote "No" on 65, and "Yes" on 67. Note: This post was modified to clarify the ramifications of Proposition 65.